Every time claims go up we hear about holidays falling at unusual times, seasonal adjustment problems, weather related problems —- there seems to be no shortage of reasons to dismiss weakness in labor markets. 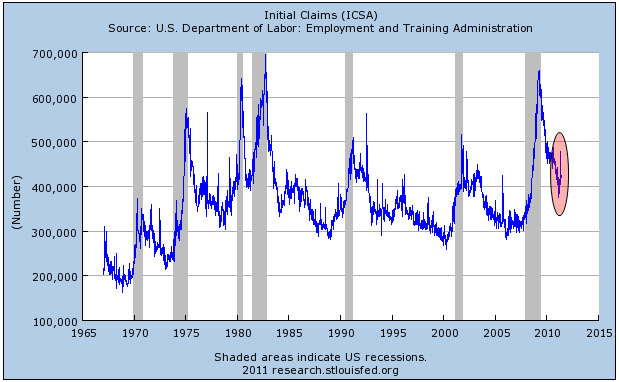 So I’ll be interested to see what excuse policymakers come up with this time to ignore the unemployment crisis. As the attached chart shows, this is hardly the first time there’s been a short spike during an economic expansion. You can see big ones in 1977, 1992, and 2006 and smaller ones in several other years. If this one only lasts a month or two, it’s no big deal. But if it lasts longer, the excuses are going to start to wear pretty thin.